The Land Rover Discovery Sport is the world’s most versatile premium compact SUV. Uniquely in its segment, Discovery Sport’s dynamic design combines 5+2 seating configurability with design and engineering integrity in a compact footprint. 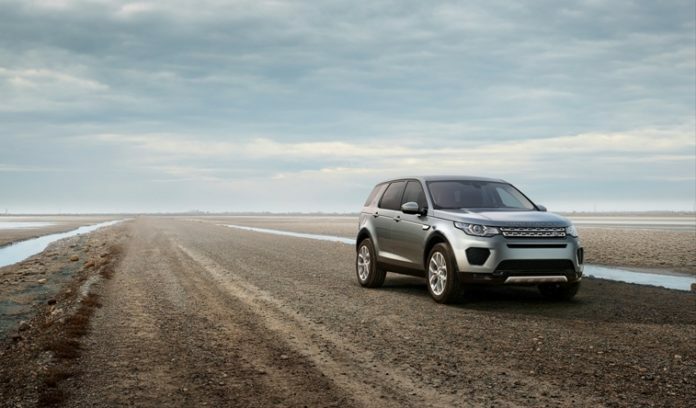 “The launch of Discovery Sport was a pivotal moment in Land Rover’s history. Not only did it mark the introduction of the first new member of our expanding Discovery family, which has since been joined by its bigger brother the New Discovery, it also brings the versatility of 5+2 seating to the compact premium SUV market. Designed and engineered at Land Rover’s centre of excellence in Gaydon, UK, Discovery Sport is produced at the company’s award-winning manufacturing facility in Halewood, Liverpool, UK. Since going on sale in quarter one of 2015, it has gone on to sell 350,000 vehicles in over 170 markets worldwide. Discovery Sport is clearly identifiable as a Land Rover and shares a consistent design approach to the recently-launched New Discovery. The vehicle brings a sense of dynamism and projects an image of confidence with its wheel-at-each-corner stance. The vehicle’s striking interior delivers a high level of versatility with 5+2 seating and elegantly integrated stowage areas. This is complemented by a wide choice of superior quality materials to give the vehicle a premium look and feel. Discovery Sport projects a dynamic attitude. 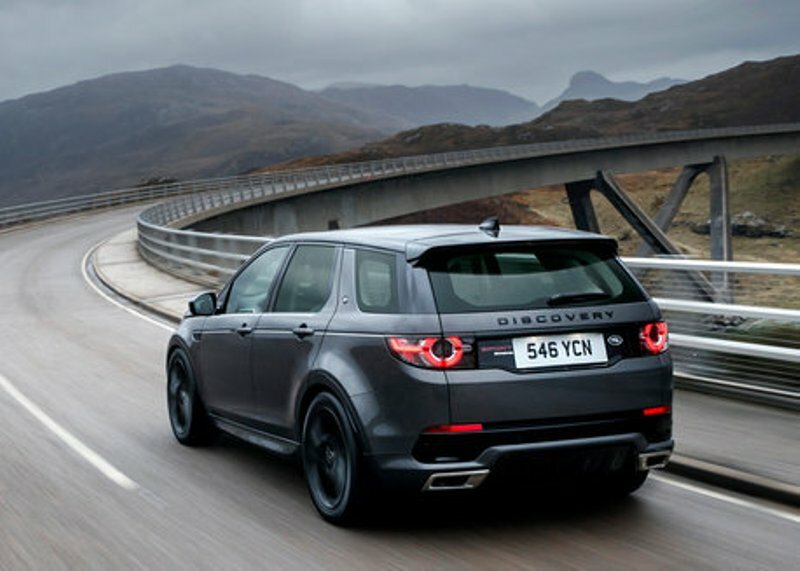 Optimised volume, proportions and stance ensure a striking visual impact without compromising the functionality and engineering excellence for which the iconic Discovery nameplate is world-renowned. At 4,589mm long, Discovery Sport’s compact footprint is 381mm shorter than the New Discovery yet its generous wheelbase of 2,741mm creates exceptional legroom. This has allowed Land Rover designers to push the wheels out towards all four corners of the vehicle resulting in a visually robust, compact stance and low centre of gravity that’s suggestive of Discovery Sport’s agile, planted driving experience and unrivalled all-terrain capability. Sleek, wraparound corners further reduce visual bulk of the front and rear overhangs. Signature design features include the clamshell bonnet and distinctive two-bar grille with hexagonal mesh, which complement the perfectly balanced proportions. Smoothly contoured body surfaces, strong and dynamic lines, and robust detailing (including rugged skid plates) signal Discovery Sport’s incredible breadth of capability. The fast bonnet line with pronounced step into the rising belt line conveys a dramatic stance, while the roof tapers subtly downwards, adding extra dynamism. Discovery Sport’s dynamic profile optimises aerodynamic efficiency with an impressive 0.37Cd, enhancing performance, fuel economy and refinement. Wind noise has been minimised through Computational Fluid Dynamics (CFD) and exhaustive wind tunnel tests. Particular attention was paid to key areas such as the shape of the A-pillar and door mirrors, and a special acoustic windscreen lamination reduces wind noise further. Additional CFD tests were used to greatly reduce road grime or dirt being transferred onto the rear of the vehicle, particularly beneficial on unmade roads or in harsh winter conditions. Discovery Sport’s optimised volume and proportions are enhanced with carefully considered design details. A strong C-pillar graphic is key in creating the vehicle’s dynamic profile; it rakes dramatically forwards and stops short of the gloss-black window surrounds, allowing for an optional contrast roof graphic. The Discovery Sport headlamp design makes a strong visual impact, with a slim, wraparound design and circular daytime-running lights (DRLs). The DRLs are punctuated at four equal intervals to represent the points of the compass and underline the sense of adventure integral to Discovery DNA. Every Discovery Sport is fitted with Halogen headlamps and DRLs, upper trim levels feature Signature headlamps, and customers can also specify Signature Plus headlamps. Signature headlamps feature Xenon and LED technology, while Signature Plus add adaptive-cornering technology to match the light beam to the driver’s steering angle. The headlamps’ striking graphics are echoed in the tail lamps, with a wraparound design and a choice of standard or Signature lamps. 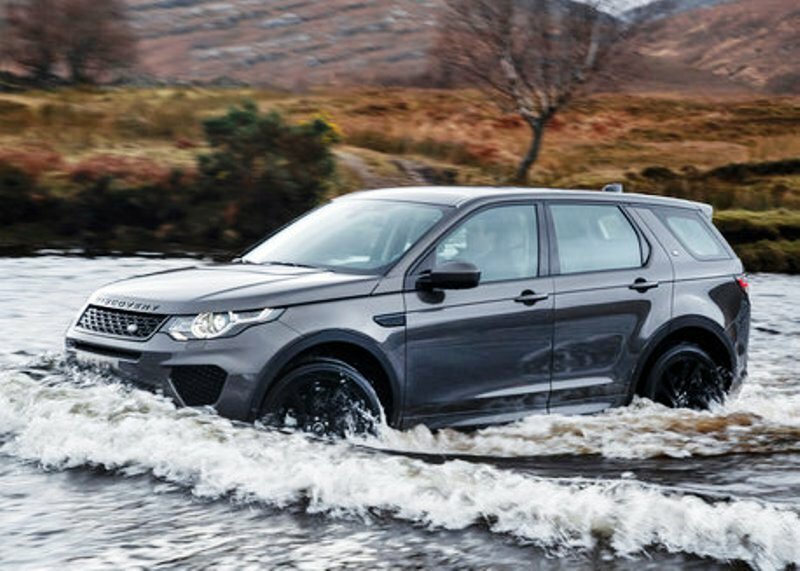 Robust bumpers reflect the go-anywhere capability of Discovery Sport. The front bumper houses large outboard air intakes with LED fog lamps, while a bold trapezoidal lower intake conveys a sense of strength and houses the central bumper beam and skid plate. The rear bumper reinforces this bold design theme, with a rugged skid plate flanked by twin exhaust outlets. Distinctive Land Rover fender vents with a horizontal, blade-like graphic that flows into the feature line sweeping along the body. Purposeful wheel-arch mouldings with distinctive castellations pay homage to Land Rover’s unique heritage.At the rear of the vehicle, the spoiler’s carefully crafted inner extensions optimise airflow for exceptional aerodynamic efficiency. A centrally mounted high-level spotlamp uses advanced LED light-pipe technology, for a distinctive and visible ribbon of light. Discovery Sport’s palette of 12 colours aligns with the larger New Discovery’s colour options. These include Solid colours: Fuji White, and Narvik Black; Metallic: Indus Silver, Yulong White, Scotia Grey, Corris Grey, Santorini Black, Firenze Red, and Byron Blue; and Premium Metallic: Namib Orange, Carpathian Grey, and Silicon Silver. Offering further differentiation, the Black Pack emphasises the vehicle’s sporting appearance with a gloss-black grille, door mirror caps, front fender vents, bonnet and tailgate lettering and a choice of eye-catching 19- or 20-inch alloy wheels. For further distinction, a contrast roof extends to the base of the A-pillars and is available in either Santorini Black or Corris Grey. A range of seven distinctive alloy wheel designs – including the striking Aero Viper – is available with a selection of Sparkle Silver, Dark Grey, Gloss Black and diamond-turned finishes depending on wheel design. Discovery Sport’s interior has been designed to provide a versatile and calming space, one in which every occupant feels equally comfortable and the driver is able to pay maximum attention to the road. At an early stage in the vehicle’s development programme Land Rover designers invited a large cross-section of families to a UK development centre. The design team watched on as the families climbed into a variety of SUVs, accessed third-row seating, synced electronic devices, attached child seats to ISOFIX anchor points and placed drinks containers in cup holders. The results helped shape the Discovery Sport into the most versatile premium compact SUV. Discovery Sport’s interior is a highly-configurable space, making it perfect for demanding family schedules and active lifestyles. Land Rover designers have prioritised head-, knee- and shoulder-room, and interior space is excellent in all derivatives thanks to a wheelbase of 2,741mm, while the backs of the front seats are ergonomically contoured to unlock even more knee-room. A selection of four trim levels is available: Pure, SE, HSE and HSE Luxury. From SE specification, the second-row seating is offered with tilt-and-slide functionality, and is individually adjustable with a 60:40 split. This enables row-two occupants to recline their seats or slide them forwards or back by 160mm and still benefit from 999mm of legroom. Alternatively, load capacity can be increased as desired from 813-litres to as much as 981-litres with row-two seats in place. With both rear rows folded flat, the volume increases to 1,777-litres. Extra attention has been paid to slim-line packaging of the vehicle’s electrical architecture – for instance mounted electrical modules and routing harness run as space-efficiently as possible – in the side panels of the load space to maximise volume. The multi-link rear axle also ensures the rear suspension turrets create minimal intrusion into the luggage area. These innovations are key for Land Rover to offer 5+2 seating. This provides rear seating that’s not only easy to access and comfortable for third row passengers, but can also be folded away to provide luggage volume equal to that of a five-seat derivative. In fact, both second- and third rows can be folded down using one hand to create an even greater load area. The load-space floor has been located as low down as possible, increasing space and ensuring that even large items are easy to load and unload. Row-two seating is fitted with ISOFIX anchor points for child car seats. The anchor points are easily accessed by removing two caps and slotting the child seat’s attachment points between two guides; it makes fitting child seats and swapping them between family cars as painless as possible, enhancing both safety and convenience. A great deal of collaboration between exterior and interior designers has resulted in a significant packaging solution. For instance, row-two occupants benefit from stadium seating that’s raised 50mm relative to the vehicle’s front-seats. The result is a cabin that feels more open and inclusive for row-two occupants while still providing plenty of head-room for even taller passengers. Row three passengers’ seats are raised to provide better forward vision of the road, a key contributor to minimising occupant sickness. Discovery Sport is available with up to four 12V power points, while as many as six USB charging sockets can be specified for all three rows. This allows multiple electronic devices to be recharged simultaneously. Two different centre console storage solutions are available. Pure and SE derivatives provide space for two cups along with a separate roller storage section; HSE and HSE Luxury derivatives have a larger console that includes a sliding armrest and a roller storage section with two removable cup holders located underneath; this space can be separately and quickly re-configured to offer space to securely hold a two-litre bottle. Storage areas have been designed to be as deep and accommodating as possible. The door speaker housings not only complement the interior’s clean lines and ensure excellent sound quality, they also provide the maximum space for stowage. At 13.8-litres, Discovery Sport’s front and rear door housings offer more than double the stowage space of some rival SUVs. In typical Discovery tradition, a simple but effective convenience hook allows loose items to be secured in the passenger footwell. Row-three passengers have a storage shelf, and load-space rails are available to add further versatility. Discovery Sport customers can choose from two air-conditioning systems: a manual interface is fitted to entry-level models, while dual-zone climate control with an LCD interface for the driver and front-seat passenger is also available. For dual-zone systems, the air vents for row-two occupants are mounted mid-way up the B-pillar for more effective cold-air distribution. If both dual-zone climate control and 5+2 seating are specified, an independent control unit is available, allowing row-three occupants to set their desired temperature and fan speed; row-three air vents are also positioned mid-way up the C-pillar. Other convenience features include a sensor to detect and automatically clear windscreen misting, and an air-quality sensor that switches to re-circulation mode should high pollution levels be registered. ECO mode optimises the air-conditioning system – along with other vehicle settings – for maximum efficiency. “The Discovery Sport’s bold architectural forms combined with distinctive, premium finishes create an environment that is a pleasure to spend time in while offering unparalleled levels of versatility to meet the exacting requirements of our customers,” said McGovern. The centrepiece of the cabin is the striking intersection between the bold vertical lines of the centre console and the slimmer horizontal elements of the instrument panel. The pronounced centre console architecture ensures all controls are grouped logically. Soft-touch rotary controls and buttons set into a gloss-black surround create a tactile user-interface and are easy for the driver to find under the glare of direct sunlight. A clean and elegant three-spoke, multi-function steering wheel frames a modern and easy-to-read instrument cluster. Housed under a compact curved binnacle, the instrument cluster’s twin analogue dials are set deep in circular housings. A central five-inch colour TFT display is positioned between the twin dials, presenting key data such as fuel levels, gear position, temperature and Terrain Response® modes. All derivatives specified with the nine-speed automatic gearbox are fitted with paddle shift controls, allowing the driver to manually select each gear for added control during towing or in challenging off-road and dynamic on-road scenarios. Discovery Sport features a raised Sports Command Driving Position to provide the driver with a clear view of the road ahead, while the interior is characterised by clean, elegant lines. All materials used in the Discovery Sport’s cabin are of high quality, designed to be premium, not precious. The HSE Luxury, for example, has twin-needle-stitched leather on the upper roll of the instrument panel and door surfaces. This creates a premium feel while the vertical spars on the centre console are available in a genuine metal finish, heightening luxury without impacting on longevity. Entry-level Pure models are available with a mix of Resolve and Tofino cloth trim, while all other derivatives feature leather upholstery, from grained part-leather on SE models through to luxurious Windsor leather on the range-topping HSE Luxury. A selection of six interior colourways is available: Ebony, Cirrus, Glacier, Ivory, Almond and Tan. Interior ambience can be further enhanced by subtle and highly configurable mood lighting, controlled via the central eight-inch touch screen.